This fantastic & beautiful antique Victorian window has outlived the original frame, and been rehoused in a substantial pine frame. REMOVED FROM A PROPERTY IN THE YORKSHIRE DALES. Of English origin from around the 1900 mark. 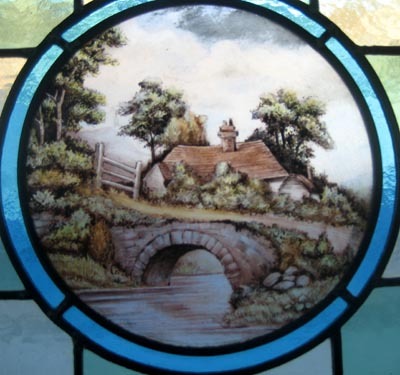 BEAUTIFUL CENTREPIECE - PAINTED AND KILN FIRED SHOWING A BEAUTIFUL COTTAGE WITH BRIDGE. The coloured glass of these windows has a rich deep texture. 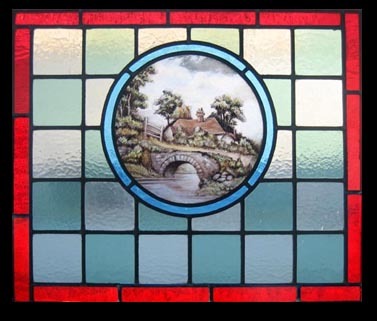 This old heavy glass picks up and softly diffuses the colour of the light falling upon it, window frame measures 22 1/2"W x 19"H The glass is 19 1/2 " x 16"
Shipping and packing for USA would cost $149. You can buy this now in your own currency by clicking on the credit card icons (Paypal if you prefer) below the photograph or e-mail sales click here to arrange payment by personal check ,money order or bank transfer. Shipping includes full insurance.